Is Iran’s doomsday countdown clock similar to Haman building the gallows? 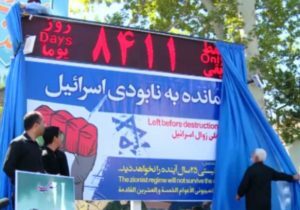 “The rally also inaugurated a huge digital countdown display at Tehran Palestine Square, showing that Israel will allegedly cease to exist in 8,411 days. Iran is sealing their own fate. What does the Bible say about such people? Do not keep silent, O God! “For behold, the day is coming, burning like an oven, when all the arrogant and all evildoers will be stubble. The day that is coming shall set them ablaze, says the Lord of hosts, so that it will leave them neither root nor branch.